Mr. Smith served as second flute with the Boston Symphony Orchestra. Among his many fans, Fenwick Smith’s annual flute recital was a sign that autumn’s classical music concerts had begun. “In its way, it’s as sure a seasonal token as the furnace’s first rumblings, frost on the pumpkin, and yard sales,” Globe critic Richard Buell wrote in 1993. Though Mr. Smith didn’t envision a tenure stretching some three decades when he gave his first recital in the mid-1970s, he soon found that audiences eagerly anticipated each year’s performance as the crowds outgrew venues. The Cambridge Friends Meeting House gave way to the Longy School of Music, and he moved the concerts to Jordan Hall after joining the New England Conservatory faculty. He settled on an annual Sunday in September, the timing owing much to his role as second flute with the Boston Symphony Orchestra. September was “a logical time to do it because the BSO was on vacation,” he told the Globe in 2001, just before his 25th annual recital. It was a month when “there was not much happening,” even though many were searching for classical concerts. As accomplished a craftsman as he was a musician, he built the flute he played and nearly single-handedly constructed a summer house in the woods of the Berkshires, a few miles from Tanglewood. Mr. Smith, who last performed with the BSO in August 2006, died July 19 in Springhouse in Jamaica Plain of complications from Alzheimer’s disease. He was 68 and had also converted the aging Masonic Temple in Roslindale into living quarters and a recording studio. “He was a superb flutist, a superb musician, and a superb teacher,” said Leone Buyse, a former acting principal flutist for the BSO who sat next to Mr. Smith for many years. Mr. Smith, she said, brought musical intelligence and a keen collaborative ability to the second flute position. “It was a sense of knowing how to blend, how to really lock into another person’s ideas,” said Buyse, who also is a former principal flutist for the Boston Pops and is now a professor at Rice University’s Shepherd School of Music in Houston. During Mr. Smith’s fall recitals, his playing was front and center, and critics took notice. “He plays the flute fabulously well, with a big, pliant vocal sound over the entire range, unclouded by vulgar excesses of vibrato,” the Globe’s Richard Dyer wrote in 1985. The younger of two brothers, Mr. Smith grew up in Medford. His mother was the former Marion Bonner. His father, Newlin R. Smith, was an economics professor at Tufts University and a director of fund-raising to build the Cambridge Friends School, a Quaker school. Mr. Smith initially attended Westtown School, a Quaker school in Pennsylvania, and finished high school at the Cambridge School of Weston, said Janet Corpus, a friend and Mr. Smith’s power-of-attorney. He graduated in 1972 from the Eastman School of Music at the University of Rochester in New York, where he studied flute with Joseph Mariano and where Buyse was a few years ahead of him. For a dozen years, starting as a teenager, Mr. Smith worked building flutes for Verne Q. Powell Flutes, now located in Maynard, and eventually set aside flute-making after joining the BSO in 1978. For five years Mr. Smith was the BSO’s acting assistant principal flute. He also had been first flute with the Boston Pops, and earlier in his career he was a member of the New England Woodwind Quintet. Mr. Smith, who had lived in Germany for a few years, also had been a member of Boston Musica Viva, a contemporary-music ensemble, and was the founding flutist of the Boston Chamber Music Society. 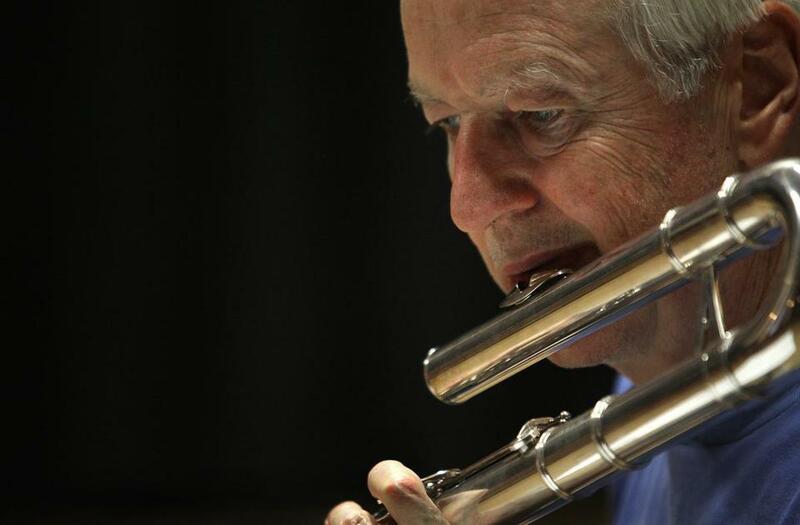 The Boston Musicians’ Association named him musician of the year in 2008, and two years later the National Flute Association honored him with a lifetime achievement award. In 2013, the winner’s recital for the James Pappoutsakis Memorial Flute Competition was renamed the Fenwick Smith Tribute Concert. At New England Conservatory, Mr. Smith was a studio teacher and chamber music coach, and in 2001 he received the school’s Laurence Lesser Award for excellence in teaching. Sometimes he and Buyse taught classes together at the conservatory. “It was a wonderful example for the students to see how it’s important to share ideas and be open to another person’s way of expressing musicality,” she said. John Heiss, a flutist who teaches at New England Conservatory, composed pieces for Mr. Smith to perform at his annual fall recital. Mr. Smith, an advocate for new music, insisted on recording “Serenade,” an album of Heiss’s compositions. A memorial service will be held for Mr. Smith, who leaves no immediate survivors, at 1 p.m. Oct. 28 in the Cambridge Friends Meeting House. Mr. Smith first showed signs of failing memory about a dozen years ago, and his friends said his acceptance of the diagnosis provided an example to them. His Quaker upbringing could be seen in much of his life, from the few clothes he owned to the careful frugality he brought to all tasks, from music to building his solar, post-and-beam house in the Berkshires and renovating an old building in Roslindale.